Research Computing utilizes a 2-factor authentication utility called Duo that must be utilized in order to log into RC resources. This document covers installing and logging in with Duo for CU Boulder users only. You will receive a Duo invitation when your RC account is created. Open your Duo invitation email (from Duo security or duo.com) on a desktop/laptop computer. Within one business day you should recieve a duo invitation. If you didn’t receive an invitation or your invitation has expired, then please contact rc-help@colorado.edu for a new invitation. Login to RC Resources via ssh as described below. Duo Invite email may be sent to your Spam folder. Do not request a phone call if you want to use the Push app for authentication. Duo accounts are purged if unused for 6-9 months. Please contact us at rc-help@colorado.edu if you encounter any issues with Duo setup. Duo offers a variety of methods to log into your account. Depending on what you select when setting up your Duo account, you should have several different methods of 2-factor authentication when logging into RC Resources. Duo Push is Research Computing’s recommended method of 2-factor authentication. Because Duo Push is tied to your physical smart device instead of a phone number or account, Duo Push is provides a more secure method of 2-factor authentication than either SMS or phone call. Enter your identikey password when prompted. Wait for a push to your phone. Note: Duo push is tied to your device so so you will need to add or remove your device if you get a new phone. A list of one-time-passwords (OTPs) will be texted to you via SMS. Another login prompt will appear on your screen. Using the first OTP in the list, login with your password as mypassword,OTP. For example, if my password is Ih3artdu0 and my OTP is 330456 I would type (without quotes): Ih3artdu0,330456. Note that the next time you login, you can either request a new list of OTPs using Step 2 and then enter the first OTP via Step 3, or you can just use the next OTP in the list, and skip directly to Step 3. Wait for a phone call. Answer the call, select option #1, and you will automatically be logged in. If you prefer a physical device, similar to the Vasco OTP. You have to arrange with RC staff to acquire a token. There is a small fee for this device. Email rc-help@colorado.edu for assistance. 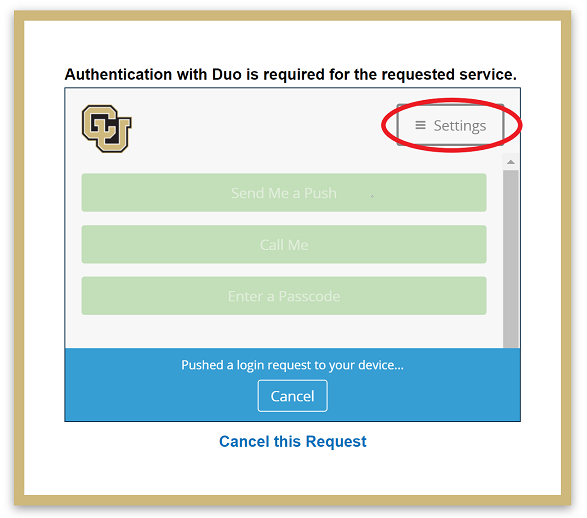 Users can manage their own Duo devices by visiting https://duo.colorado.edu. This can allow users to add or remove activated devices at their discretion. This will bring up a menu that provides several options on device management and general help. Clicking “Add a new device” will allow you to add a new smart phone, tablet, or land-line. Simply select the option you wish to add and follow the steps provided by Duo complete setting up your new device. Selecting “My Settings & Devices” provides a more detailed list of all devices you have registered. From here you can also add a new device, set your default device, and change your default authentication method when you attempt to log in.